Full redaction. You redact all of the contents of the column data. The redacted value returned to the querying application user depends on the data type of the column. For example, columns of the NUMBER> data type are redacted with a zero (0), and character data types are redacted with a single space. The Data Redaction policies enable you to create a wide variety of function conditions based on SYS_CONTEXTvalues, which can be used at runtime to decide when the Data Redaction policies will apply to the results of the application user’s query. 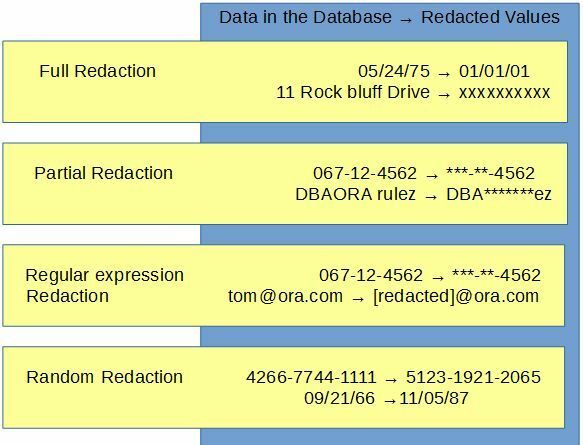 In the next article we will show how to configure Oracle Data Redaction.